Nothing says HOLIDAY like Red Velvet Brownie Whoopie Pies with Cream Cheese filling. 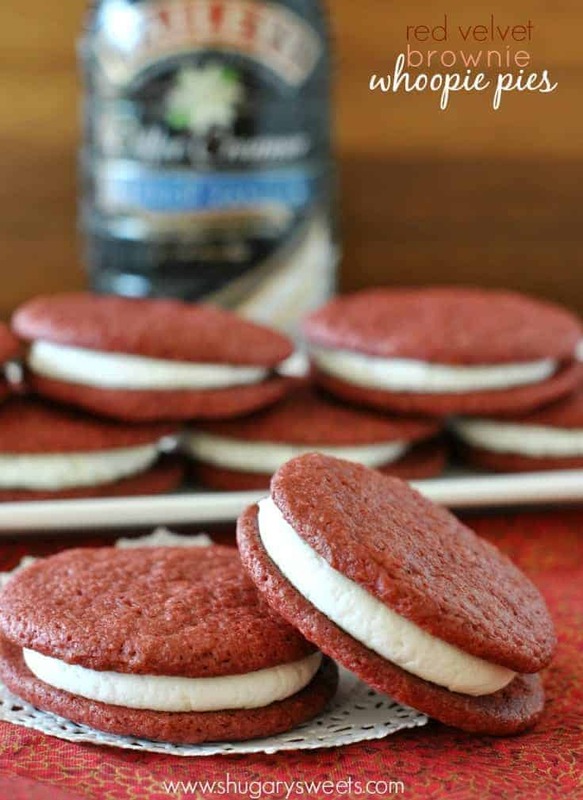 BAILEYS Red Velvet Cupcake Coffee Creamer is the perfect flavor enhancer in these delicious Whoopie Pies! Have you seen the new flavors of coffee creamer from BAILEYS yet? Last month I shared a recipe that I created using the Pumpkin Spice creamer. 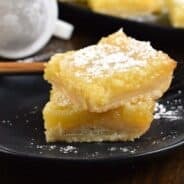 Remember these shortbread bars? Today, I’ve got another delicious recipe for you. 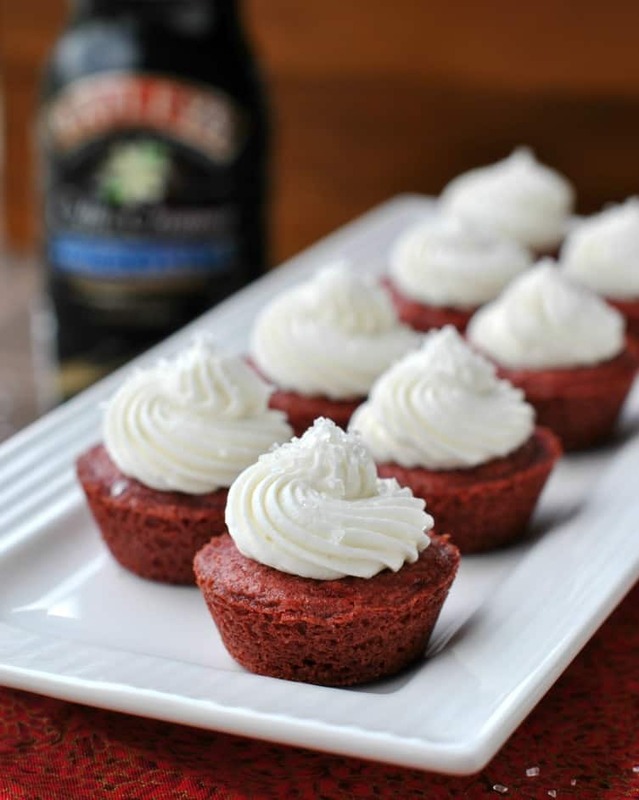 I used the BAILEYS Red Velvet Cupcake Coffee Creamer (yes, as good as it sounds)! And I hope you love it because I gained about ten pounds creating this recipe. I may not even be exaggerating! You see, I needed to create a recipe that the BAILEYS team could travel with while on a marketing tour. So my first attempt was red velvet brownie bites. They were delicious. And gorgeous. But after about 4 recipe takes, I realized they wouldn’t travel well. See they had a pile of frosting on top of them that could easily smoosh. Right? My mind went straight to whoopie pies. 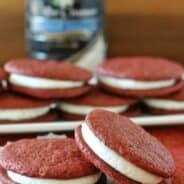 But, the original brownie bite recipe I created did NOT make good whoopie pies. They were either flat. Or they didn’t have enough “chew.” My next try was too cake like. I wanted these whoopie pies to taste like a chewy brownie. A chewy RED VELVET brownie. After another 5 or 6 attempts (I am DEFINITELY NOT exaggerating), I hit the nail on the head! These whoopie pies are perfect. And the cream filling? Well, please make sure each pie has a decent swirl of filling, it’s necessary for this dessert! In a large mixing bowl, cream butter and sugars together until fully combined, about 2 minutes. Beat in eggs, one at a time. Add creamer and mix until combined. Add the flour, cocoa powder, red gel food coloring and baking powder. Mix until fully combined. Cover bowl with plastic wrap and refrigerate for at least one hour. Preheat oven to 350 degrees F. Line a cookie sheet with parchment paper. Set aside. Spoon about one tablespoon of dough onto baking sheet. Bake brownies for 8-10 minutes, until slightly firm to touch. Slide parchment paper to wire rack and cool completely. For the filling, beat cream cheese and butter in a mixing bowl for 3-4 minutes until light and fluffy. Add creamer and powdered sugar and beat an additional 3-4 minutes. Spoon filling into a large Ziploc bag and cut off tip. Pair brownies into like sizes. Pipe a circle onto one brownie and top with second, creating a brownie whoopie pie. Store brownies in an air-tight container at room temperature or in the refrigerator. Be sure to follow directions and refrigerate dough before baking!! Don't skip this important step!! If you can't find the Red Velvet Coffee Creamer...substitute a French Vanilla instead! **This post is part of an ongoing brand ambassadorship with BAILEYS creamers. I was compensated to create my own recipes and video, however all opinions about the product are 100% my own. Aaaaand, I’m in love. I haven’t tried the Red Velvet creamer yet, but the Pumpkin Spice was amazeballs. I L-O-V-E anything Red Velvet!! 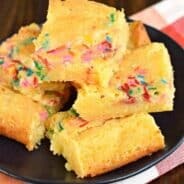 These look quite delicious! and you are such a trooper!! If a recipe doesn’t come together for me after 2 or 3 tries I am DONE!! I had no idea they had this flavored creamer! Such an exciting reason to come up with a recipe and it looks delish too! What?! I know exactly who I would give these to! I’m not the hugest red velvet fan, but I have a friend who is. Even so, these look really good! Sandwich cookies always get me and I can’t say no to anything brownie! Love red velvet. 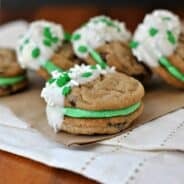 Mixing it into a whoopie pie is genius! Ohmygod there is a red velvet CREAMER out in the store RIGHT NOW?!? Excuse me while I run/skip all the way there and back so I can drink oodles of coffee and eat ALL these whoopie pies! Omg these look so good! I’m definitely going to make them for a Christmas party this weekend! I’ve looked everywhere for the baileys red velvet cupcake creamer and had no luck 🙁 where did you get it? I can find it at Walmart!